Homesteading is all about self-sufficiency – but what do we do when we become injured or ill? If your homestead is rural, chances are you don’t have access to a 24/7 pharmacy in the middle of the night. 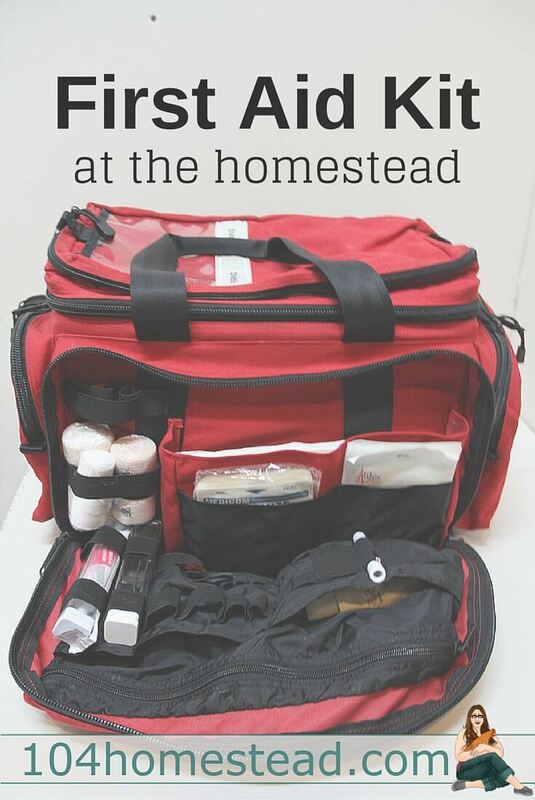 Even if you are homesteading in the middle of New York City, there are still some essentials that you must keep on hand to take care of yourself, your family, and even a neighbor in need at a moment’s notice. The Red Cross has a list of 19 items they recommend for every well-stocked kit including sterile bandages, gauze, scissors, a one-way barrier (for performing mouth-to-mouth resuscitation), tweezers, thermometer, non-latex gloves, antiseptic wipes, and ointment, among other things. If a cut is not too deep, clean extremely well with a small syringe, apply a couple drops and hold together until skin bonds. Especially useful when a blister has burst, clean the blister well, cut open vitamin E capsule and squeeze oil directly onto open sore. Immediately cover with sterile, non-stick bandage. The skin will heal almost overnight! Our go-to for sunburns and heat burns. My husband and my kiddo will testify to the power of Chamomilla to relieve a toothache, for teething and non-emergent tooth pain. This one’s for mama, and for anyone with a headache, over-worked, stressed out, PMS, and terrible cramps. For the scary high fever that is scalding hot to the touch and comes on suddenly. These come in a hundred varieties, right now we’re into the ThermaCare instant heat packs that don’t contain smelly menthol, of course, we also keep Tiger Balm handy, too. We keep an aloe plant on the window sill in the kitchen in case of cooking burns. Some folks may take issue with the “natural” remedies in my first aid kit: when in need, make sure you have something that works, not these hinky, dinky, natural, maybe/kinda gonna work remedies. If you are inexperienced with natural remedies like Belladonna, for example, keep Tylenol instead. Next time your little one suddenly comes down with a scalding hot fever, give a low-potency dose of homeopathic Belladonna. Wait 15 minutes (this is perfectly safe in the case of fevers, really…). Keep the Tylenol close by, and take his temperature 15 minutes after giving the homeopathic. Did the temperature come down? Does he seem more comfortable or relaxed? Maybe he even fell asleep… all these are signs the remedy is working, and Tylenol maybe isn’t necessary for that instance. Experimenting with natural remedies in non-emergency situations will build your confidence in using them when you need something that works now. The one thing that can never be emphasized enough, no matter what’s in your First Aid kit is that you know how to use it! Pre-packaged kits come with instruction booklets – but did you ever bother to read it? I promise it’s 100% more effective (and worth the investment) to open the kit now and read the instructions completely before the inevitable happens! Step #1: Take a deep breath. Tell yourself to stay calm, because you know exactly what to do. Staying calm and centered – instead of frantic, panicked, and chaotic – will determine the outcome of any emergency. Now you can approach your kiddo, and help him take a few deep breaths while you calmly examine his hand. Acknowledge the pain, establish rapport, change the focus. I know what you’re thinking! Hurry, there’s no time to sit and chat! Fix the problem now! But in reality, this crucial step takes maybe 10 seconds. Now you’ve got your kiddo on your side, helping with the process, instead of being more scared, or obstinate, or unreasonable while you’re rushing to the sink. The worst part is over – it’s all about healing from here. For more resources on Verbal First Aid techniques, I highly recommend The Worst Is Over: What to Say When Every Moment Counts by Judith Acosta and Judith Simons Prager. Hold the burned area under cool (not ice cold) running water. Explain how this stops the pain. Here’s where your well-stocked First-Aid kit comes in so handy: you know exactly where it is and what’s in it – either Aloe Vera gel or individual packets of burn cream (all available over the counter) and some gauze (non-latex gloves may be helpful here, too). Jimmy is reassured that the injury may not be so bad after all, he is proud to have participated in his own healing. Jimmy is reassured that the injury may not be so bad after all, he is proud to have participated in his own healing, and (depending on his age) he might even want to help apply the Aloe Vera gel and wrap it with sterile gauze. Way to go, Dr. Mom. Extra considerations should be taken depending on where you live – how far you are from emergency services or a good neighbor, extreme weather, and family size. Rural homesteads should invest in some basic First Aid training – like what I’ve learned from Carl Weil at Wilderness Medicine Outfitters. A short course can teach you how to properly dress a deep wound, apply stitching (when necessary), how to set a fracture or reduce a dislocation, and more. No matter where you live, taking stock of your First Aid supplies – and your First Aid skills – will save you stress during emergencies, save your money from making impulse buys at the 24/7 pharmacy, and may even save a life. Flashlights, batteries, extra blankets, bottled water, matches, candles, and fire extinguishers should be kept nearby, as well. For more self-sufficiency tips, or to learn how to homestead where you live, subscribe to The Homestead Helper. Arwen Greer is an herbalist and homeopath whose wisdom comes from mother earth and the changing seasons. Her tiny homestead is located in the Rocky Mountains of Colorado where she makes her medicines and cares for her family. Visit her website The Holistic Homestead to learn more. Love this! It makes it easy to put together a kit. teaching important things. The natural remedies recipes, etc. 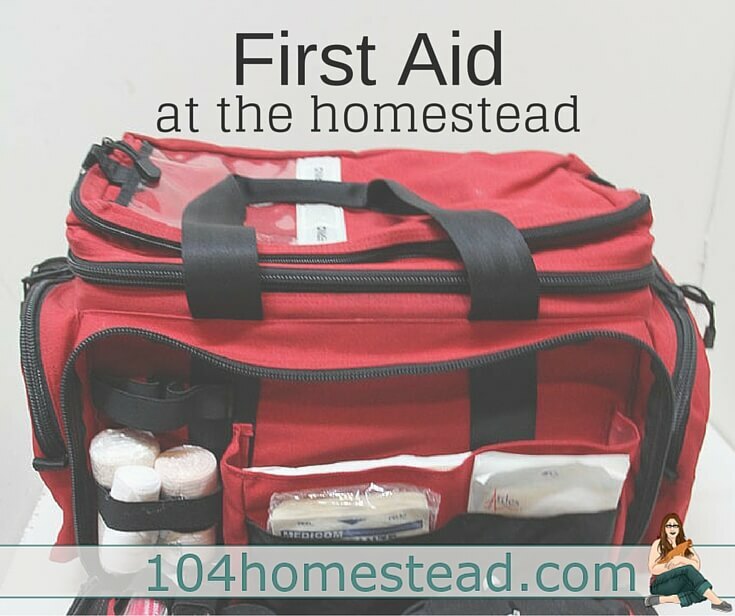 Hi, I have been on a hunt for a very good first aid kit for a long time. I’m not looking for the items to put in it but rather the kit, bag or container itself. 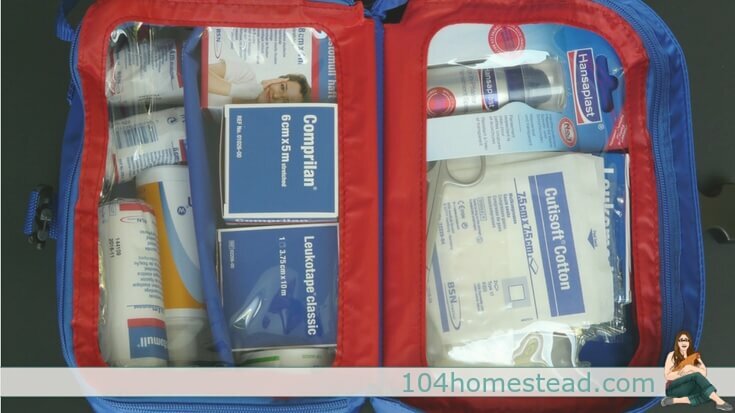 I came across your article via Pinterest and I am interested in this first aid kit bag in your pictures. Could I please inquire where you found such a bag? I greatly appreciate your help, and I also enjoyed your article! It’s actually just a carry on luggage bag.